Are you tired working far from home or looking for a gig to earn you extra money? There is a plethora of opportunities available for those who want to work from home especially the stay-home-moms. You probably went to school and had earned a degree; you spent sleepless nights working on your education so that you could further your career. Unfortunately, motherhood demands much from you, and you decide to quit your 9-5 job, or your boss is stressing you, or even the job you got does not make you happy. Regardless of your gender, age or skin or height, today's economy does not cut anybody any slack. Bills have to be paid, and you have to feed and dress your children and yourself. SO, is it possible to have a profitable and fruitful career while working at home? Well, the answer is YES! Only if you balance your life. With your professional background, experience and determination this is achievable.If you probably did not manage to get a degree, that doesn't mean you should give up. Not at all! Fear should not hold you back that your skills are not honed enough to turn them into viable dreams, relax!It’s not utterly necessary to have a distinct set of skills to be able to work from home. 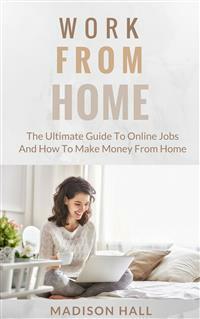 You have as many opportunities as those with degrees do; often they seek a different type of jobs out of the available pool of jobs.This book has been curated to help you work comfortably from home. We will see the different careers you could take while working from home, the advantages as well as the disadvantages of working from home and how to set up a routine that will help you manage your time wisely.I invite you to grab a copy of this book and change your perspective of working from home. All rights reserved. No part of this guide may be reproduced in any form without permission in writing from the publisher except in the case of brief quotations embodied in critical articles or reviews. The information contained in this book and its contents is not designed to replace or take the place of any form of medical or professional advice; and is not meant to replace the need for independent medical, financial, legal or other professional advice or services, as may be required. The content and information in this book has been provided for educational and entertainment purposes only. The content and information contained in this book has been compiled from sources deemed reliable, and it is accurate to the best of the Author's knowledge, information and belief. However, the Author cannot guarantee its accuracy and validity and cannot be held liable for any errors and/or omissions. Further, changes are periodically made to this book as and when needed. Where appropriate and/or necessary, you must consult a professional (including but not limited to your doctor, attorney, financial advisor or such other professional advisor) before using any of the suggested remedies, techniques, or information in this book. Upon using the contents and information contained in this book, you agree to hold harmless the Author from and against any damages, costs, and expenses, including any legal fees potentially resulting from the application of any of the information provided by this book. This disclaimer applies to any loss, damages or injury caused by the use and application, whether directly or indirectly, of any advice or information presented, whether for breach of contract, tort, negligence, personal injury, criminal intent, or under any other cause of action. You agree to accept all risks of using the information presented inside this book. You agree that by continuing to read this book, where appropriate and/or necessary, you shall consult a professional (including but not limited to your doctor, attorney, or financial advisor or such other advisor as needed) before using any of the suggested remedies, techniques, or information in this book.